How do I delete Blog entries? You can delete only one entry (and its associated comments) at a time. To delete multiple entries, you would have to delete the entire blog via the Blogs tool. 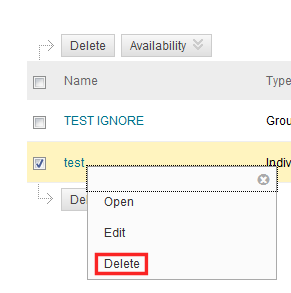 To delete a blog entry, please click on the chevron next to the entry and select Delete. To delete an entire blog (this cannot be recovered! ), open Control Panel > Site Tools and click either Shared Blogs or Private Blogs. Now click the chevron next to the blog name and choose Delete.